The Ghent Altarpiece, the 18-panel polyptych masterpiece painted by Hubert and Jan van Eyck for the Saint Bavo Cathedral in Ghent, Belgium, has had a tough life since it was completed in 1432. It’s been taken apart, stolen, split, burned, vandalized, cropped, pawned, hidden and shipped cross-continent. Even its permanent home in Saint Bavo, a glass enclosure built to protect the altarpiece from vandalism and theft, has proven inimical to the painting because of its inability to control temperature and humidity. In 2008, a committee was convened to address the urgent conservation needs of one of the greatest and most influential works of medieval art ever made. 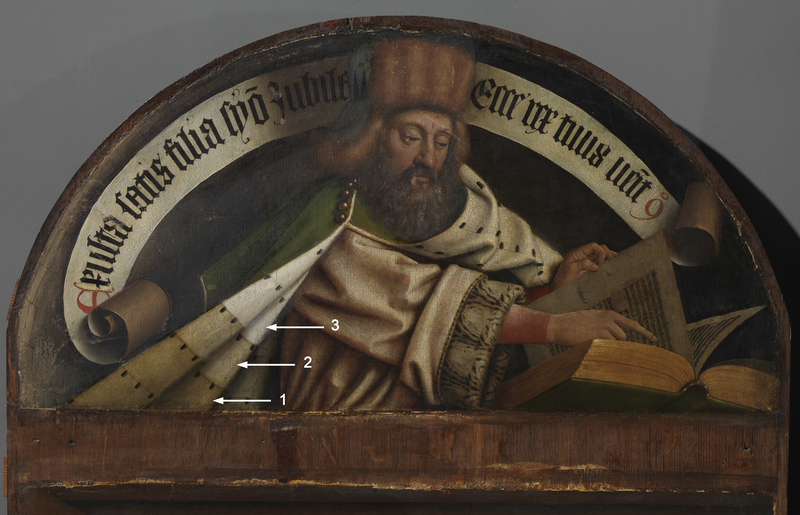 After an in-depth study of each panel in situ, a grant from the Getty Foundation’s Panel Painting Initiative and the creation of a fantastic website of high resolution scans and photographs, in October of 2012 the first eight panels — the outside wings — were removed from the polyptych and brought to a custom-built studio in the Ghent Museum of Fine Arts. There the Royal Institute for Cultural Heritage (KIK-IRPA) began a campaign of conservation and restoration. The first cleaning phase saw the removal of yellowed and cracked varnish, much of it a synthetic ketone variety added in the 1950s. Older varnish and overpainting underneath the top layer were targeted next. 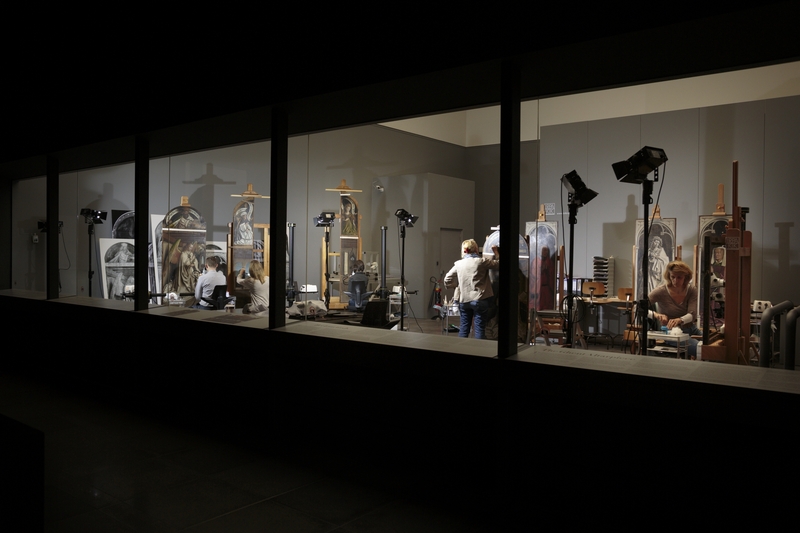 Conservators also used cleaning windows to investigate the original frames which the van Eyck brothers considered an integral part of the polyptych. The cleaning windows revealed that the polychrome paint layer — a faux stone effect — isn’t all overpaint as was originally thought. There is later overpaint, however, and the cleaning revealed that the quatrains painted on the frames underneath the retouching and overpainting are actually different from the historical transcripts of them, a highly significant discovery. To those early finds we can now add new information uncovered as the conservation project continues. As the KIK-IRPA conservators worked to clean the outer panels, they discovered that a surprisingly large part of the visible paint layer is actually overpaint. 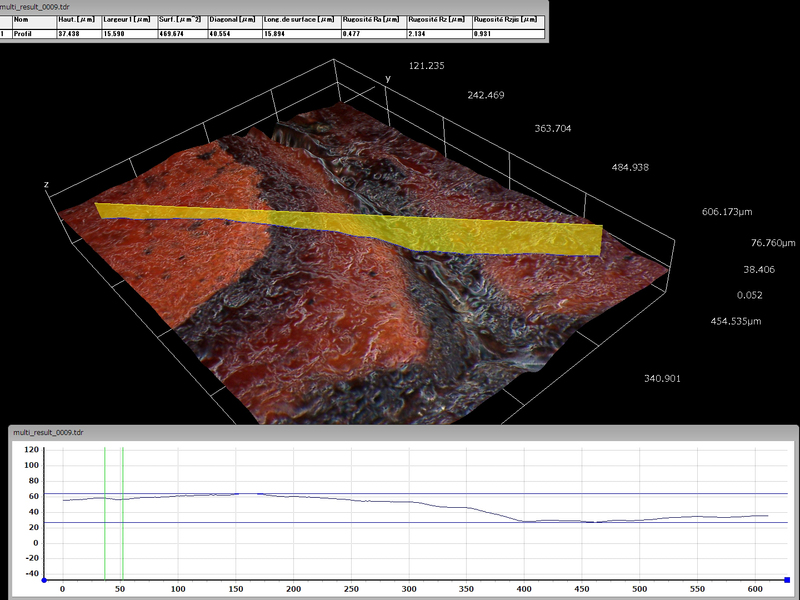 Previous analysis had failed to recognize this because the overpaint follows the age cracks of the original layer. The clothing of almost all the figures, the architectural elements in the background, the sculptures of John the Baptist and John the Evangelist, the highlights on the faces and hands are all overpainted. This find is of major art historical import, because while the overpainting follows the original closely, those early restorations were workmanlike. 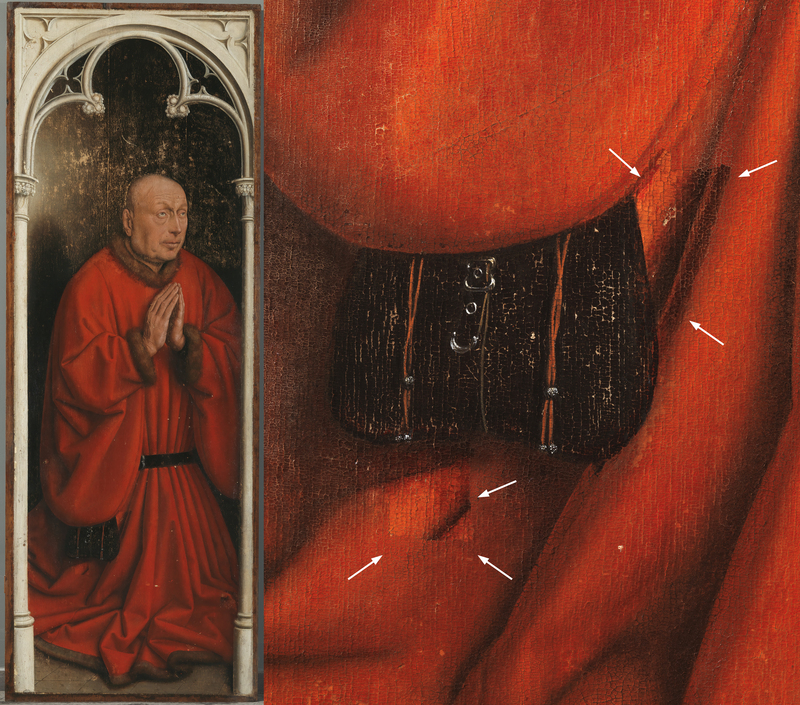 They can’t compare to the van Eyck brothers’ gifts for conveying the texture of fabric and the light and shadow. The 3D effect of a fold of clothing that the van Eycks were able to produce was flattened by the subsequent interventions. The overpaint also cut corners, painting over details the restorers weren’t capable of duplicating. 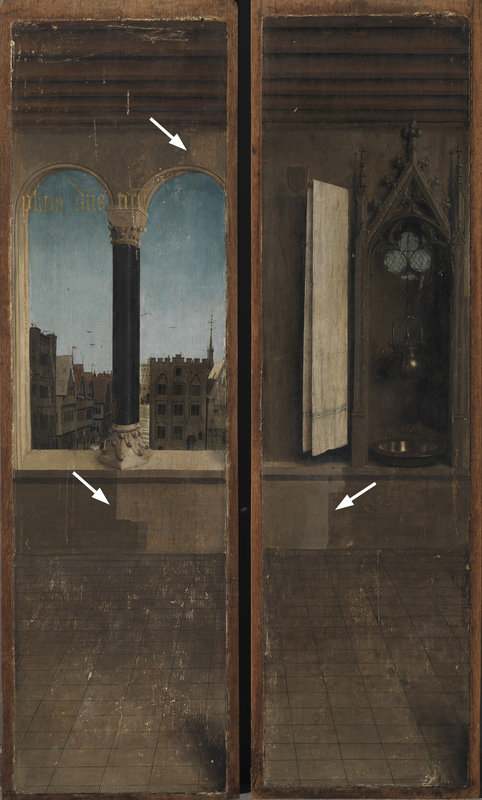 When conservators removed the black overpaint from sections of the panel depicting donor Elisabeth Borluut, for example, they found cast shadows and cobwebs hidden underneath. 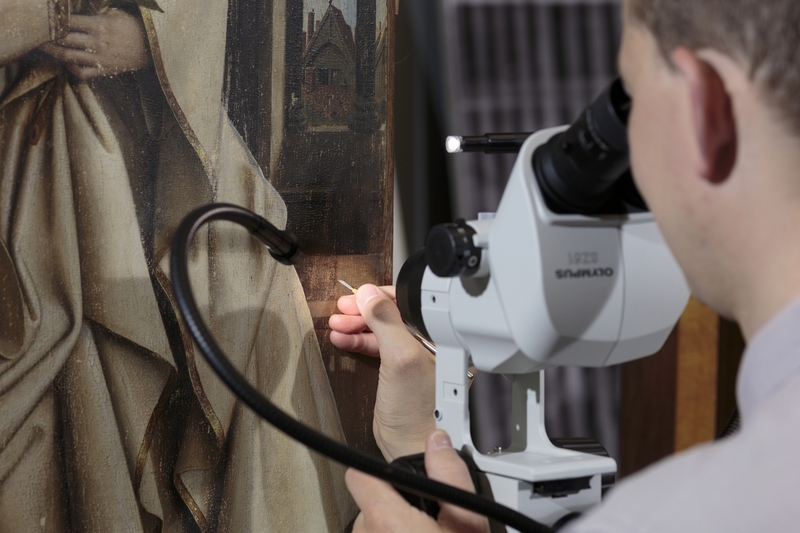 Paint samples analyzed with a 3D Hirox microscope by Ghent University scientists and by Macro X-Ray Fluorescence at the University of Antwerp confirmed the conservators’ observations. Cleaning tests on the panels determined that the original paint layer is in good condition, with little paint loss or abrasion from the overpaint. The conservation committee thus decided to go ahead and remove the overpaint. The painstaking process involves lifting the top paint layer bit by bit with a scalpel viewed under a binocular microscope. The next phase of the conservation program will bring the new discoveries and analytical techniques to the interior panels that are still on site at Saint Bavo’s. 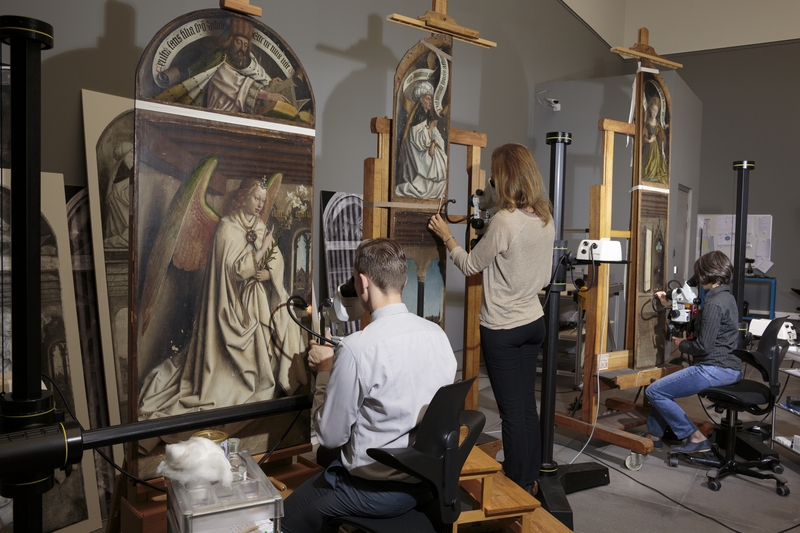 They too will be studied using 3D Hirox microscope and Macro X-Ray Fluorescence, cleaning windows will reveal the extent of the overpainting and if conditions allow, we may soon see a whole new Ghent Altarpiece that hasn’t been seen in 500 years or so. Meanwhile, thanks to financing from the Flemish government, the micro climate of the altarpiece’s glass enclosure has been stabilized. 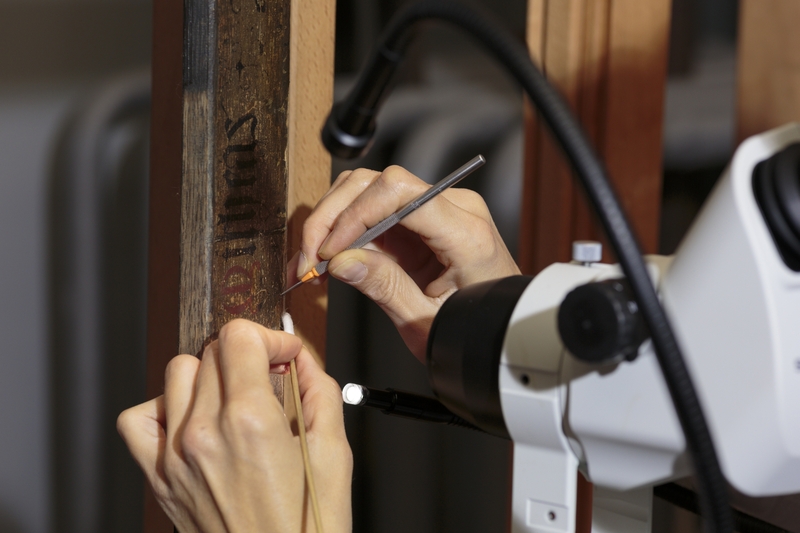 New LED lights thermic isolation liners now keep the temperature and relative humidity steady, protecting the wood and paint of the polyptych from dangerous fluctuations in heat and moisture. It’s not a permanent solution, but it will keep the altarpiece safe for the medium long-term. Once this conservation project is complete, the Closer to Van Eyck: Rediscovering the Ghent Altarpiece website which currently hosts the beautiful high resolution images of the altarpiece, will be expanded to cover the new discoveries and analyses. It will also feature a documentary on the current conservation program. This entry was posted on Wednesday, June 25th, 2014 at 11:03 PM	and is filed under Medieval, Modern(ish). You can follow any responses to this entry through the RSS 2.0 feed. You can skip to the end and leave a response. Pinging is currently not allowed. I find it interesting/frustrating that they are not posting UV light images on the blog…but it is fantastic just the same.